A youth named Raju Oraon age 21 years was mauled to death by an elephant at Shishukhola village near Totapara tea garden in Dooars. Yesterday evening a elephant moved away from the herd at Diana jungle and came towards Totapara jungle. 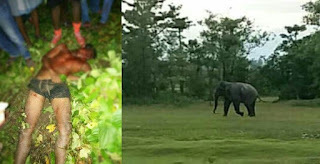 Meanwhile Raju was cutting grass and was attacked by the elephant, killing him on spot. Locals informed the forest department. Soon officials from Binnaguri forest department and Jalpaiguri wildlife reached the spot. The body was recovered and sent to Jalpaiguri district hospital for post mortem. Earlier too several such incidents have taken place in Dooars. Many houses, crops have been destroyed by elephants and several people have been injured.